This was a surprising statistic to my colleague Kate, who doesn’t have kids. I thought it was surprising too, but because the number sounded too low: Fatherly reports that parents eat 13.5 percent of their meals standing up or on the go, resulting in 156 meals per year consumed vertically. So I fit right into the demographic for this study, was conducted by One Poll for Jenny Craig, in an attempt to examine family eating habits. Fatherly reports that “in addition to eating meals on the go or upright,” the study “found that time-strapped parents often cut corners when it comes to healthy eating. Ninety percent of the 2,000 parents surveyed said they make a less healthy meal choice due to time constraints. Another 25 percent claimed this was regular behavior.” Sounds awfully familiar. 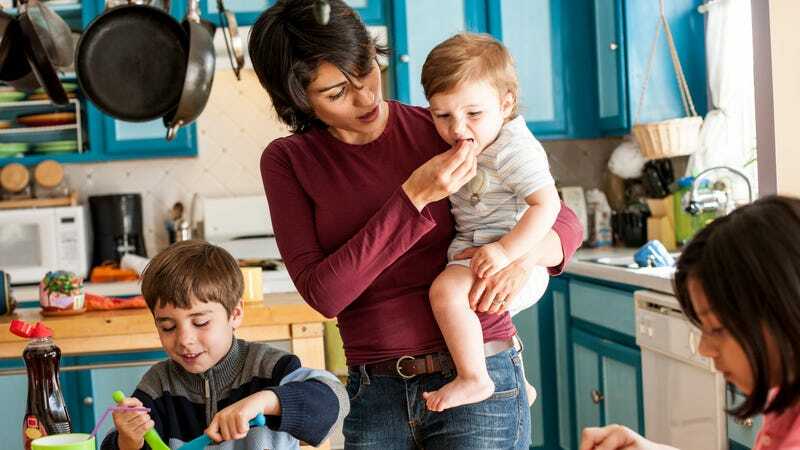 So does this finding: “93 percent of parents who admit to late night snacking due to time constraints during the day.” So rest assured, busy parents: If your meals consist of leftover scraps eaten standing up, you’re far from alone. Also—fortunately—this phase will not last forever.